I've been knitting lace for the last few months. Can't seem to go back to the socks I started last winter. I finished an Estonian lace shawl (for my daughter) and an Estonian lace scarf (for my mother) and am now working on a shawl for myself. 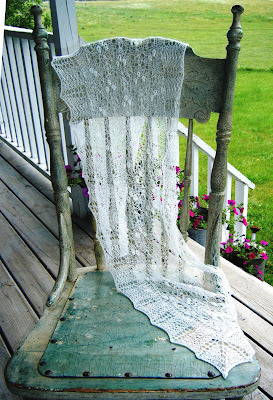 The patterns for these three come from "Knitted Lace of Estonia" by Nancy Bush. I really enjoy the nit-pickiness of the lace. The chair in the photo with the scarf is from the home of my Great-Grandparents. It's an oak-leaf press-back wooden chair with a leather seat. It has multiple layers of old cracked paint. I love it exactly as it is. It is one of my very favorite possessions. Here's the shawl. I knit it for my daughter to use on her wedding day. She was beautiful. I will post again when I have some wedding photos of it. Both the shawl and scarf were made of "Alpaca with a Twist - Fino" which is an alpaca/silk blend. Absolutely the most beautiful laceweight yarn you could imagine. 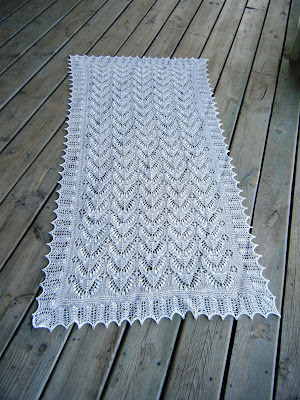 My next project (interspersed with some plain jane washcloths) is another Estonian lace shawl, this time for myself. I am using a silvery taupe yak/silk blend in cobweb weight. I got it from the "Pack River Yaks" booth at the Shepherd's Harvest Festival. Not sure about how it will go with cobweb weight yarn... so we'll see.